Unfortunately, sometimes it is not enough just to create a great product and push it out into the big world hoping for the best. The truth is you need to chaperone it all the way and help people around to get to know it. Do you know how many clients you lose because of poor customer support? Up to 50%. People are often confused and frustrated when trying out something new. Don’t you kid yourself thinking that someone will actually read the Terms and Agreements or some kind of manual before using the product or even after detecting a problem using it. Most customers tend to be helpless and will turn to you for help. Either they are in fact technically challenged or just lazy and inattentive, it is your responsibility to have their back. For many entrepreneurs providing customer support seems to be a burden. Ridiculous! Getting feedback from your clients is essential both for improving your product and for building a solid client base. Great support can win you customers and put behind your rivals. 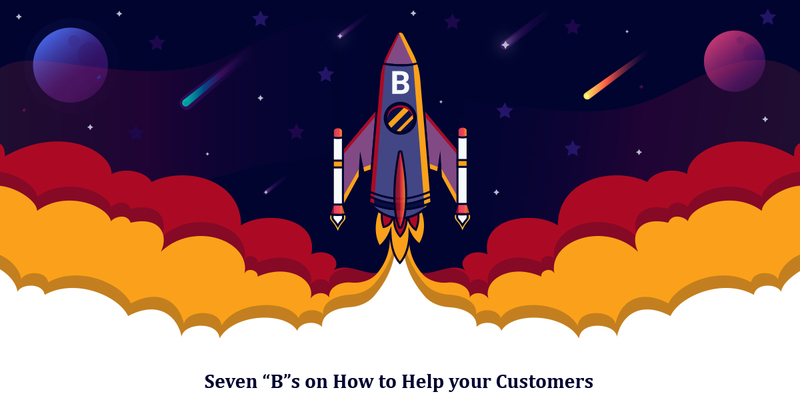 So make it your advantage now using the seven “B”s on how to help your clients effectively. It is up to you how to provide tech support to your customers, but the more options you introduce the more feedback you get. You can offer support via chat box, e-mail, Skype, instant messages or telephone, but in any case be sure that you can handle the flow of requests. If not, it would be better to stick to just one option. E-mail seems to be the most convenient one because it gives you enough time to answer. However, do not abuse this liberty and try to answer within 24 hours. The more responsive you are the more loyal the customers will be. It is simple: the more languages you speak the more clients you get. However, if you don’t have time to learn foreign languages, at least make sure to bring in translators to convert the most important documentation and the FAQ page into other languages and when your business is big enough hire native speakers from all over the world to work in your tech support team. Also, do not hesitate to use Google Translate when answering to your non-English speaking customers. The trick is to develop the right approach of communication with your customers. No matter what sector of business you are in, you don’t want to be either chillingly polite and distant nor excessively friendly while answering people’s concerns. When turning for help your clients want to communicate with a real person and not a robot, so make sure they know your name and in return ask how you should address them if their name was not stated before. Do not write in a formal style, get rid of bookish words and don’t try to sound smart. Moreover, it is perfectly normal to simplify your explanation according to the level of acknowledgement of a person and illustrate your clarification with additional material. Maybe it would be even better to use a screen capturing program and show the customers how to do something rather than to write a step-by-step instruction. A picture is worth a thousand words, you know. While it may save you some time and effort do not get carried away with sending out templates or clichés as a response to your customers’ concerns. First of all, it is obvious when you use canned phrases, they seem very impersonal and people do not like to be neglected. Moreover, those automatic letters with the template answers are often useless and fail to solve the problem raised by the request of a customer. If you run a fairly large enterprise, it would be beneficial for your business to provide customers with a possibility to get in contact with each other. It can be anything from an old-school forum to a group chat in some messenger. The main point is to create a place where your clients could share their own experience, ask questions and get answers from other customers. Basically, by setting up such a place you’re enormously “expanding” your support team. Give your clients a chance to find the answer to any issue promptly and effortless. We’ve already mentioned that most customers are not going to wade through stout volumes of the Comprehensive Manual you had prepared for them before launching your product. However, it is essential to give your clients the possibility to find answers to the most popular issues without having to contact the support team. Create an FAQ page and a Help Center with a keyword search option and update those every time you get and answer a question from a client. While your business is not very big it is ok to manage the customer support all by yourself. It is actually quite advantageous because no one knows your product better than yourself thus no one could ever explain it to other people more precise than you. Nevertheless, it could be exhausting to answer countless requests from customers alone especially when you should be working on improving your business overall, for example developing a new release of the app. Thus, you will need a team. While the e-market is crammed with cheap labor, spare no expense for hiring professionals who will go into trouble and thoroughly study your product before starting. Anyway, make sure you can monitor the work of your support operators and do so from time to time.